This is an excellent recording of the Great C Major, but it takes a bit of getting used to. Iván Fischer's main focus is on the dance origins of the music, and he makes sure that the rhythms of those dances always come through. That makes for some wonderfully characterful playing, the music continually pulled around to give the dances life, while also being grounded by heavily accented downbeats. It is an interpretation that is all about the moment, and the symphonic coherency of the work is never treated as a pressing concern. True enough, the piece is finely crafted, and remains coherent even when the conductor is not making any special efforts to link the larger sections. But even so, it is a risk that only just pays off. One of the main reasons why it does work is that the players are all on Fischer's side. The performance standards here are exceptional, but more importantly, the conductor is able to communicate his unusual conception of the work to the orchestra in such a way that they are able to make it seem intuitive. All that is left is for the listener to put their preconceptions to one side, and it might take a few repeat listenings before that is achieved. You could argue that the reading lacks grandeur, but Fisher reminds us that the opulence of this symphony is always provisional and that it owes as much to Schubert's earlier chamber music as it does to Beethoven's Ninth. And there are occasional passages that are performed with symphonic breadth. The triplet ascending passages in the main theme of the finale, for example, open out into wide vistas, and while the dynamics in this last movement often seem micromanaged, they also articulate long and coherent build-ups or transitions. The orchestra is a hybrid of modern and period instruments. Fischer opts for narrow bore trombones and hand horns, but the rest of the orchestra is thoroughly modern. This sets up fascinating tensions between new and old. The opening, for example, is played on hand horns, the players audibly straining against the unevenness of their instruments. Then the (modern) woodwind enter and everything suddenly becomes easier and more laid back. It is a great effect, which Fischer describes in these terms: "Only when the oboe takes over is the unevenness polished away, removing limitations and barriers and transporting us into a magical realm of eternity." If you are an advocate of period instrument performance, you may take issue with Fischer's views. For example, is a hand horn deficient for associating different sound qualities with specific pitches? Fischer goes on to compare the struggle of hand horn players against the unevenness of their instruments with the struggles of handicapped athletes. That strikes me as controversial, and as these views underpin the reading of the symphony, you might find yourself objecting to the recording on ideological grounds. It is worth bearing in mind though, that Fischer always keeps things light. Everything here is dancing and optimism. He makes the dance connection explicit by including at the end Schubert's Five German Dances and Seven Trios with Coda D89. It is trivial music really, and if it appeared at the end of any other reading of the C Major Symphony it would seem wholly inappropriate. The fact that it fits well after Fischer's reading says much about the rustic charm that he finds in every phrase of the symphony. The SACD sound quality is up to the usual high standards of Channel Classics. The liner is informative, although the 17 (including the ads for other releases) photographs of Fischer himself on the packaging come worryingly close to hagiography. 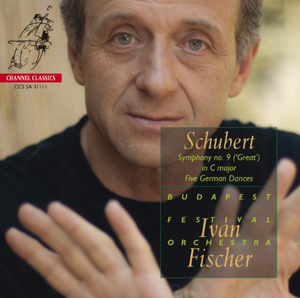 On the other hand, he has certainly put his personal stamp on this recording, so it is probably more logical to put his face on the front cover than Schubert's.